Donovan Deekman signed a 3-year contract until 2012 with an option for another season in June 2009. He was a product from the Heerenveen youth academy. 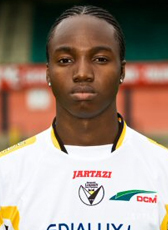 The young striker returned home at the end of his Belgian contract. He signed a contract at Sparta Rotterdam in June 2012 for the 2012-13 season and continued in 2013-14. Deekman moved to Romanian club Concordia Chiajna at the start of the 2013-14 season. In January 2015 Deekman left Romania to play for Iranian side Naft Tehran. After half a year he left the club from the capital of Iran. In February 2016 Deekman found himself a new club, signing for SC Telstar for the rest of the season. At the end of the 2015-16 season his contract was not renewed. In 2017 he went playing for a short time on the Malediven islands. Currently Deekman is home in the Netherlands and looking for new opportunities.